A board certified plastic surgeon specializing in rhinoplasty and cosmetic plastic surgery of the body and face. His practice is located in Glendale, California. Dr. Grigoryants provides his patients with effective and most advanced plastic surgery procedures in the safest possible environment. Patients come to Los Angeles to have procedures performed by Dr. Grigoryants from all over the United States as well as from other countries. Voted by his peers and recognized as a Top Doctor 2018 by Los Angeles Magazine and by Pasadena Magazine. His extensive surgical experience and artistic ability allowed him to improve some of the plastics surgical procedures resulting is better outcomes. His rhinoplasty techniques were published in the internationally read Aesthetic Plastic Surgery Journal (June, 2013) and his experience with lipoabdominoplasty (advanced tummy tuck surgery) was published in the Aesthetic Surgery Journal (January, 2013). Dr. Grigoryants is a peer reviewer of rhinoplasty articles submitted for publication to a plastic surgery journal. During your consultation we will evaluate your concerns and goals. We will then discuss potential treatment options making sure that you are fully informed before making a decision. Your consultation will be conducted in a very friendly and relaxed atmosphere. We will not recommend and will advised against procedures that are not likely to produce a good outcome. We apply up-to-date medical knowledge and technology to achieve best possible results and make your recovery as fast as possible. You will be able to contact the doctor directly with any questions or concerns following your procedure. 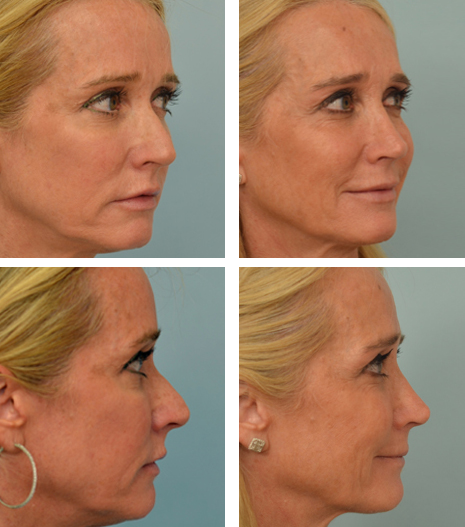 Dr. Grigoryants specializes in closed or scarless rhinoplasty (nose reshaping or nose job). Rhinoplasty is performed to improve the shape of the nose and in many patients to improve breathing. Dr. Grigoryants performs endonasal (closed) rhinoplasty to avoid unpredictable scarring on the nose. He places incisions inside the nose so that no scar will be present across the bottom portion of the nose. Dr. Grigoryants performs open rhinoplasty in some cases of complex revisions. 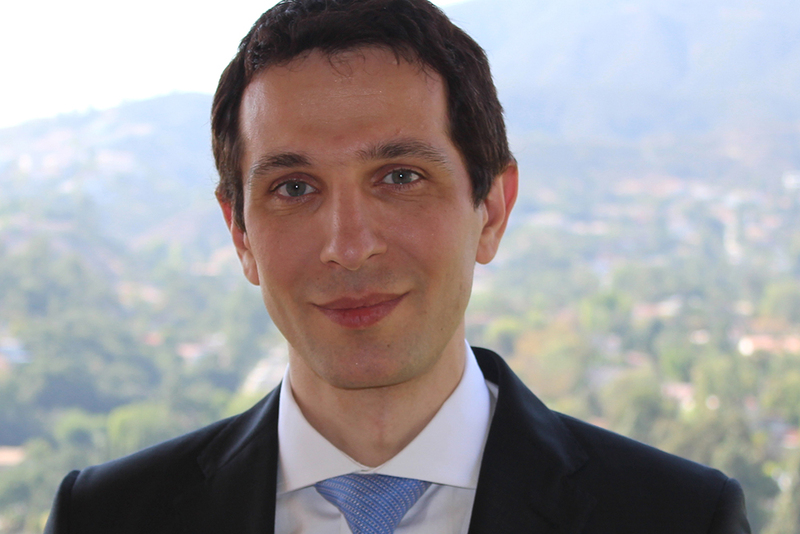 Dr. Grigoryants' ethnic mix of patients is diverse including Caucasian, Middle eastern, Hispanic, Asian, and African American ethnicities as his patients come to him for rhinoplasty not only from Los Angeles but also from various parts of the world. Certain nasal anatomy traits and skin thickness variations exist among different ethnic groups. These should be taken into account when performing ethnic rhinoplasty to achieved desired results. Your nasal anatomy and skin thickness will be discussed with you during your consultation. Is performed along with cosmetic nose reshaping (rhinoplasty) or alone in patients who are mainly interested in improving nasal airway patency. Mechanical nasal airway obstruction can be caused by a deviated septum, enlarged turbinates, and narrow internal nasal valve. To open nasal airways, Dr. Grigoryants performs septoplasty, turbinate reduction, and nasal valve repair. Dr. Grigoryants performs functional rhinoplasty using closed (scarless) technique. He does not use nasal packing after surgery. Many men present to Dr. Grigoryants for rhinoplasty. Some men who undergo nose reshaping prefer to maintain a masculine appearance of the nose including having a straight profile and not raising the tip above 90 degrees. Other male patients prefer to have a slightly sloped profile with a supratip break and the tip raised to about 95 degrees. Dr. Grigoryants will discuss the goals of rhinoplasty with each patient in detail and decide with the patient what shape of the nose will better suit their face. Patients undergoing facial feminization have turned to Dr. Grigoryants for nose feminization surgery. The shape of the nose greatly contributes to the overall femization of the face. 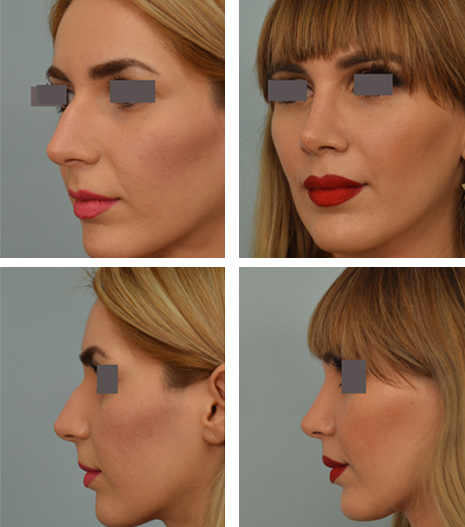 In general, to feminize the nose, Dr. Grigoryants may need reduce the dorsal hump, narrow the tip of the nose if wide, raise the tip of the nose to 95-100 degrees, and reduced the width of the nostrils. 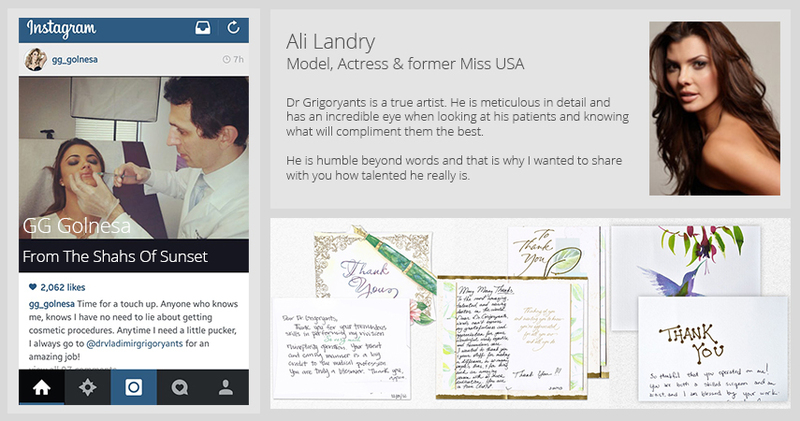 Revision rhinoplasty is commonly performed by Dr. Grigoryants. He performs revision rhinoplasty using closed and open rhinoplasty techniques. In some patients who do not have enough septal cartilage left, an ear cartilage may need to be used for nasal reconstruction. Not every patient would be a candidate for revision rhinoplasty. Patients with much scarring and thick skin are less likely to benefit from additional surgery. Dr. Grigoryants performs breast augmentation, breast reduction, and breast lift. In women with sagging breasts, breast lift will improve the shape and position of the breasts. Breast lift may be performed alone or combined with breast augmentation. Many women who are bothered by large and heavy breasts benefit from breast reduction. This procedure reduces the size of the breasts and lifts the breasts at the same time. For breast augmentation, Dr. Grigoryants uses silicone or saline implants. Is used to remove excess skin and fat in the abdominal area. During a tummy tuck loose abdominal muscles are tightened to further flatten the abdomen. Liposuction is frequently combined with tummy tuck procedures to remove fat excess from the flanks, thighs, arms, or back. Dr. Grigoryants places the tummy tuck incision in such a fashion so that the scar can be easily hidden by underwear. Patients who do not have skin excess but primarily fat excess can be effectively treated by liposuction alone. Dr. Grigoryants performs an advanced tummy tuck procedure to produce best possible results. Includes such procedures as face lift, neck lift, brow lift, eyelid surgery, and placement of chin and cheek implants. These procedures restore a more youthful appearance of the face. Face lift and neck lift procedures can also be combined with liposuction to remove fat excess in the face and neck. Non surgical facial rejuvenation utilizes such products as Botox, Restylane®, Perlane, Voluma, and other new fillers. These injectables effectively reduce the appearance of facial wrinkles. 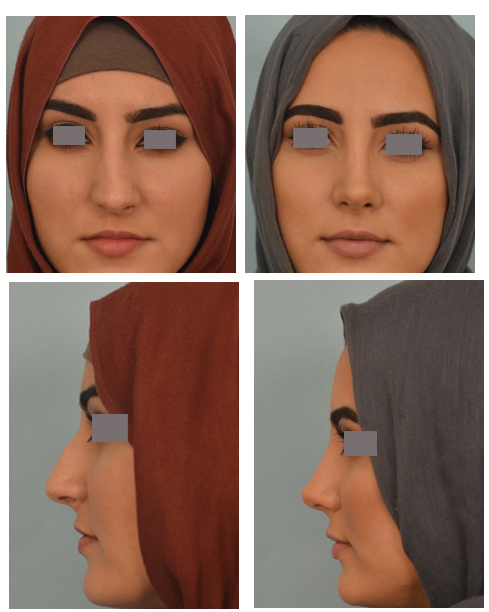 Closed rhinoplasty was performed in this patient to reduce the dorsal hump, deproject the nose, and shorten the length of nostrils. The upper lip was pulled foward by the overprojected nose (called tension lip). After surgery, the upper lip is not pulled and better balanced with the lower lip. 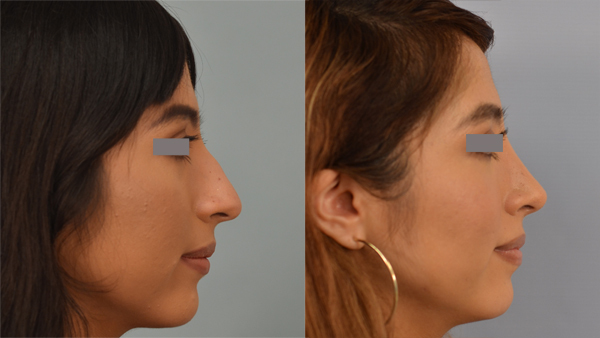 This patient underwent closed rhinoplasty to remove the dorsal hump and refine the tip, achieving a more feminine and natural result. 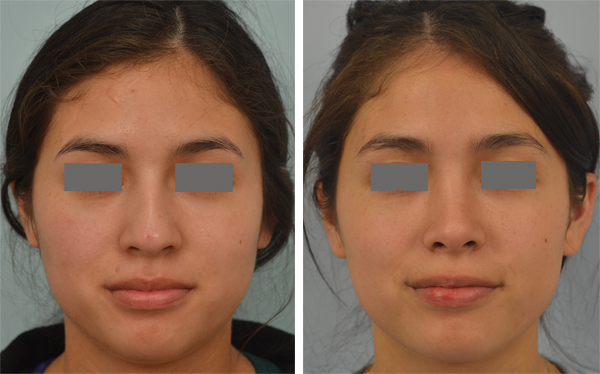 Nasal deviation was improved and septoplasty was performed to treat the deviated septum. Dr. Grigoryants performed rhinoplasty on the star of Real Housewives of Beverly Hills. 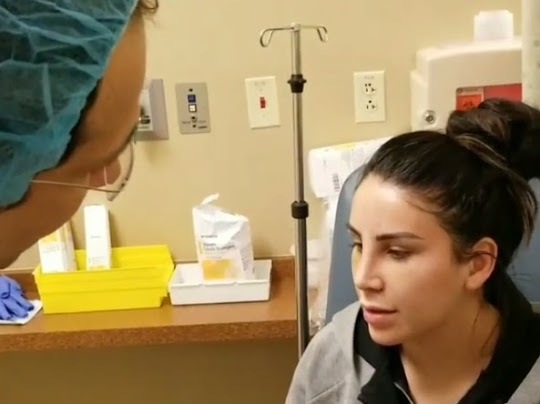 Consultation and rhinoplasty Beverly Hills was shown on season 3 of Real HouseWives of Beverly Hills. Three years after closed rhinoplasty. The tip and nostrils were narrowed. Nearly all swelling has resolved by 3 years after rhinoplasty. Closed rhinoplasty was performed to produce subtle changes. The dorsal hump was removed. The tip was narrowed and lifted. The after photo is taken 1.5 years after surgery. Please click here to view rhinoplasty videos and immediate after surgery results performed by Dr. Grigoryants. Dear Dr. Grigoryants,Thank you for your hard work and doing a great job on my surgery. There are not many doctors as patient,nice, funny, and humble as you are! Thanks for making my life more beautiful, lighter and happier. And I greatly appreciate the results.Thank you! Dear Dr. Grigoryants,I have to tell you how happy I am with the surgery you performed on me. It really changed my self image. You are the best doctor. Keep up the good work. How to have a flat stomach in 2 ½ hours:I had a tummy tuck on December 23, 2008 and I cannot thank Dr. Grigoryants enough for giving me back my confidence. When I saw myself in the mirror 5 days after my surgery I felt like I was 15 years old again with a young body and flat stomach. I couldn't believe that I didn't have any more bulging around my stomach. It is crazy the way tummy tucks work- one day you have this big fat belly and 2 ½ hours later you wake up with none. I recommend Dr. Grigoryants to anyone who is considering any type of plastic surgery. He is knowledgeable, experienced, affordable, humble, cute, and always has a smile on his face. I am forever grateful! Hi Dr. Grigoryants; I hope everything is going well with you, I am doing wonderful, I have to thank to my God first to protect me on this long surgery and keep me safe, and second of all to thank you for your great job done, It would not possible with out your nice work, also my sincere appreciation for making me feel safe and taking good care of me, it makes a big difference. Honestly I would recommend you to everyone, your kindness and professionalism it gives us patients piece of mind that we are in good hands. Thank you again. Dear Dr. Vlad I can't begin to thank you enough for your time, concern and compassion. My result to date is absolutely what I had hoped for and I can honestly say that once again I am happy.Thank you for being so attuned to my needs, understanding, my concerns and above all else-being so very diligent in my care. Dear Dr. Vladimir I don't know how to thank you for everything you did for me. My both surgeries went very beautiful and it was a dream come true. God Bless you. Dear Dr. Vladimir,Since the beggining of the world, the doctors have been trying to save people from their disorders. Some used knives, others used potions, but not all doctors are great and make each patient content with a hopeful cure. You're a great doctor for your knowledge is your crown and you understand your patients when they come to you. There is a light in your affectionate heart and it's full of deep kindeness that teaches us to be content with everyday life. I came to your office with uncertainty for I was scared of the outcome of my procedure. After our first meeting I knew that I found a great doctor who is not a hypocrite but more like a rare, shining and a precious pearl thath's very hard to find. I've admired your honesty and I trusted you without a doubt. You were there for me with an open heart, a warm smile and listening ears. After my surgery I discovered that you possess greate treasures. I came to see that there's a light in your touch and your hands work magic beyond the wildest imagination. Your mission is to bring out the unfamiliar from the most familiar.I widh you lots of luck, prosperity, blessings of joy and continued success. You've a Keen eye, even capable of seeing the unexpected. Nature isn't always generous to us. By your touch nature reaches out to us with welcoming arms, and bids us to enjoy her beauty. You're truly the Michelangelo among all doctors of our times. You create beauty with your own hands and people admire what you've created in faith. I thank you with a deep gratitude for your kindeness, support, your compelling modesty, and for the joy of having you as my doctor and being able to share your time with me. Dear Dr. Vlad,I just wanted to say thank-you for all you have done for me; my surgery was such a pleasant experience for me.I saw four other physicians to make sure that I was making the right choice, and I’m so glad I went and had my surgery with you.I wanted to enhance my look without making everyone look at my chest first! I wanted what all women want, to have the perfect size and shape. That is just what I got!!!!! !My mother was very concerned with this too, and she was made very comfortable when she came in on the day of my procedure.Your manager, Gus put her at ease from the start, and I felt very comfortable with the staff in the Operating room, everyone really showed concern and that really made me feel safe.I wonder if all plastic surgeons are like you, you seemed to really care for me as a person and not just a patient, not just a paycheck; I would have paid a lot more because of the way I was treated in your care.So I will just say thanks-you, and a big Kiss and hug! Dear Dr. Vladimir,I had a mini neck lift. I could not believe my eyes when you printed out the before and after photos, I can not believe that was my turkey neck! The results are beyond my expectations…..I really have no words to thank you.When we discussed the surgery I was put at ease, I trusted your judgment, and you gave me no false hopes for the outcome, you told me about the complications, and what I would need to do to recover. I had very little discomfort, and today feel no pain at all. I felt secure and in a very safe environment, and that really means a lot to someone that has never had plastic surgery.Well I just wanted to say a BIG thank you. Dear Dr. Grigoryants,I wanted to drop a note to thank you once again for your wonderful work, dedication, kindnesss, and consideration.To be honest, I consulted 23 Doctors here in LA! By looking at the excellent results of your previous work, and especially your taking the time to really consider my perspective. I immedeately realized you would without a doubt be the best choice for me.Thank you! You are not only an excellent doctor with a strong work ethic, but also a wonderfull person with the treatment of your patients and otherwise.I look forward to potentially working with you again in the future!Warm regards,P.S. Lots of referrals for you are already given by my mom and I.
I've been going to Dr. Grigoryants for about 3 years and have had 3 surgeries on my nose, breasts, and ears. I initially went to him because I was recommended by my neighbor and later my hair stylist. Now everywhere I go I meet people that he did surgery on. I cannot look at my photos before surgery. I am scared to see how I used to look. I never looked as good as I do now after my surgeries. I have recommended Dr Grigoryants to many people. His bed side manners are excellent but most importantly his skills as a surgeon are the best. Dr Grigoryants is a true artist. He is meticulous in detail and has an incredible eye when looking at his patients and knowing what will compliment them the best. He is humble beyond words and that is why I wanted to share with you how talented he really is. Hi everyone! Hope You are having a great week so far! So I want to give you little update on the whole nose situation!! !My surgery went amazingly well, and I really wasn't all that nervous. Although I did have some last-minute fears about letting go of my old nose. Hehe! So I reached out to my sisters, Kathy and Kyle, before I made the big step that morning! After carefully considering and being well aware of my sobriety, Dr. Grigoryants and I (along with my other doctor) moved forward with my surgery!I love my doctor. He made this a great experience for me! As for me, I felt quite reassured when I saw him that morning rested and happy. His surgery room was clean, haha! And the people he had working with him made feel safe. All in all, it was a great experience! Many patients fly in to Los Angeles to undergo surgery with Dr. Grigoryants. For out of town patients who cannot come to see Dr. Grigoryants in person, an online consultation can be done. Please contact us through this website with your contact information and what procedure you are interested in. Dr. Grigoryants will reply to you with what information and photographs he needs for the consultation. He will make recommendations based on your goals and photographs. Once you schedule your surgery, we will email you what blood tests need to be prior to surgery, information on local stay accommodations, and preoperative instructions. You will meet with Dr. Grigoryants at least one day before surgery for a consultation. On the day of surgery, Dr. Grigoryants will go over the procedure with you again. You would need to stay locally for at least 6-14 days depending on your procedure. Copyright © 2017 VG Plastic Surgery. All Rights Reserved. 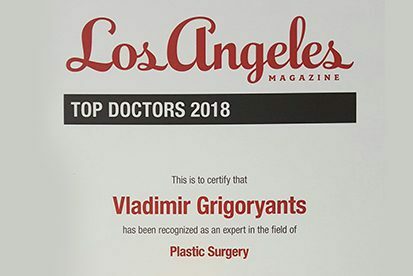 Located in Glendale, CA, Dr. Grigoryants provides services to patients coming from out of state and Southern California including Glendale, Burbank, Pasadena, Los Angeles, Encino, Huntington Park, Studio City, Arcadia, Montrose, West Hollywood, La Crescenta, La Canada Flintridge, Valencia, Bakersfield, Monrovia, Eagle Rock, Altadena, San Marino, Sherman Oaks, Thousand Oaks, North Hollywood, Long Beach, Beverly Hills, Van Nuys, Santa Monica, Calabasas, Palmdale, Fresno, Northridge, and Westlake Village, San Pedro, Rancho Palos Verdes, and Simi Valley.